Water and Power Consultancy Services Limited is a consultancy organization and public sector undertaking under the Ministry of Water Resources of the Government of India. The company provides consultancy services in the fields of water resources, power and infrastructure .Water and Power Consultancy Services has been going to announces Recruitment for the posts of Engineer Trainee Posts. Total Number of Vacancies 04 Posts. So, those candidates who are willing to work with this organization they May apply for this post on or before Dates. All Interested Candidates Should possess Full time regular Bachelor’s Degree in Engineering or Technology in respective discipline with not less than 55% marks or equivalent CGPA. 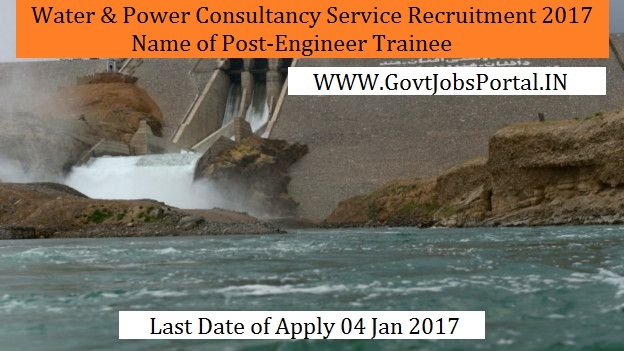 Indian citizen having age in between 18 to 27 years can apply for this Water and Power Consultancy Services Recruitment 2017. Those who are interested in these Water and Power Consultancy Services jobs in India and meet with the whole eligibility criteria related to these Water and Power Consultancy Services job below in the same post. Read the whole article carefully before applying. Age Criteria: Eligible Candidates Applicant age should be between 18 to27 Years as on 30- Nov-2016. Age relaxations will be applicable as per the rules.